Paul Will, Vice Chairman, President and Chief Operating Officer, Celadon Group, Inc. and Chelle Pfiffner, VP Strategic Employer Solutions, FusionHealth, deliver message to industry that investing in driver health is good for business. 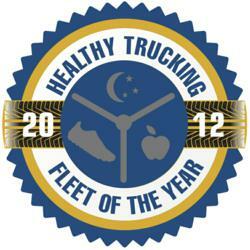 Both champion that the trucking industry has significant opportunity to lead America to better health. FusionHealth, a leading provider of Enterprise Solutions for sleep management, and Celadon Group, Inc. one of North America’s largest truckload carriers, were featured on Extreme Truckers Show™ July 12, 2012. Extreme Truckers Show™ is the largest web-based radio show devoted to Truckers and the Trucking Industry. The Extreme Truckers segment featured the role that each company has in promoting health and wellness in the trucking industry with the Healthy Trucking Awards initiative and through best practices as a leading carrier. FusionHealth® specializes in innovative healthcare technology and care management solutions for companies seeking to reduce health-related costs linked to workplace fatigue and employee sleep disorders. FusionHealth’s groundbreaking i.AIM™ platform coupled with a unique process to Analyze, Intervene and Manage sleep disorders impacts up to 30% of health-related costs for employees under treatment. For the transportation industry, FusionHealth provides the Sleep4Safety® Program, a comprehensive sleep management and DOT compliance solution to deliver robust compliance and ROI management, mobile medical management, and customized web portals for all stakeholders. For more information, please see http://www.fusionhealth.com. Celadon Group, Inc. (http://www.celadongroup.com), through its subsidiaries, provides long-haul and regional full-truckload freight service across the United States, Canada and Mexico. The company also owns Celadon Logistics Services, which provides freight brokerage services, less-than-truckload services, as well as supply chain management solutions, including warehousing and dedicated fleet services.